Virat Kohli and AB de Villiers hit fifties as RCB's losing streak finally came to an end on Saturday in the ongoing edition of cash-rich IPL. 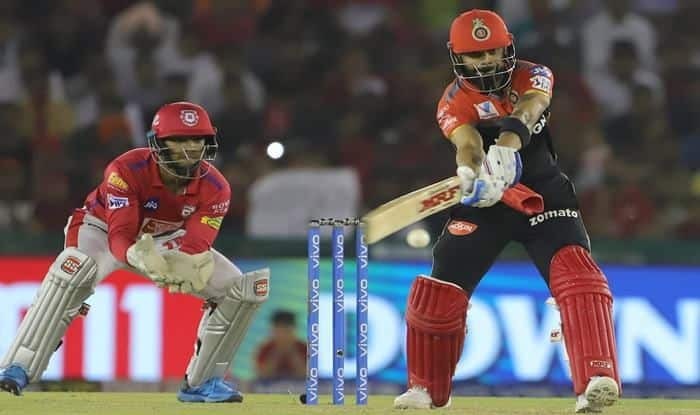 IPL 2019 Match 29 KXIP vs RCB: Virat Kohli and AB de Villiers guided Royal Challengers Bangalore to their first victory in the 12th edition of Indian Premier League (IPL) as they thumped Kings XI Punjab by 8 wickets in Mohali on Saturday. Kohli (67) in the company of de Villiers (59 not out) scripted a superb run-chase, sharing an 85-run stand to lay the foundation. RCB skipper blasted eight boundaries, while de Villiers clobbered two sixes and five hits across the rope in his 38-ball innings. R Ashwin, the KXIP skipper and M Ashwin did well to slow RCB down despite Virat Kohli’s brilliance. While Ashwin picked 1 for 30 off his 4 overs, the less-experienced Ashwin bowled his 4 overs economically, giving away only 24 runs. But the pacers – Sam Curran, Mohammed Shami and Andrew Tye struggled and had no answers in the face of de Villiers’ onslaught at the end. After Kohli’s dismissal, de Villiers was well supported by Marcus Stoinis as RCB finally had their first points of the season. Chasing 174 to win, Parthiv Patel and Kohli gave RCB a flying start, amassing 43 off 23 balls but the left-handed opener was caught by Mayank Agarwal off R Ashwin in the 4th over. De Villiers and Kohli then took the bowlers to the cleaners, picking up boundaries at will, as RCB brought up the 100 in the 12th over. Kohli completed his second fifty of this IPL season in 37 balls but runs dried up a bit in the middle with M Ashwin (24/0) and Andrew Tye (4/40) bowling a tight over each. Mohammad Shami then gave Punjab a glimmer of hope when over he dismissed Kohli, who pulled one straight to M Ashwin as RCB slipped to 128 for two. But Marcus Stoinis and de Villiers ensured there were no hiccups, sharing 46 runs, as RCB romped home comfortably in the end. Earlier, swashbuckling opener Chris Gayle missed a well-deserved century by a whisker, smashing an unbeaten 99 off 64 balls to power Kings XI Punjab to a 173 for four against Royal Challengers Bangalore on Saturday. The 39-year-old West Indian, who had suffered a back spasm after last match, carried his bat, recording his highest score of this IPL season blasting five sixes and as many as 10 hits to the fence to single-handedly anchor the Punjab innings. Gayle made RCB pay for the mistake as he hit a four and six off Umesh’s next over, before Rahul joined the party and smashed a couple of fours off the India pacer in his third over. In the sixth over, Gayle exploded as he welcomed Mohammad Siraj with a four at long off and followed it up with a six over long-on and another boundary across cover. Mayank Agarwal then joined Gayle, who completed his fifty in 28 balls. Agarwal smashed Chahal over extra cover for a six but the spinner cleaned him up in the next delivery as Punjab slumped to 86 for two.